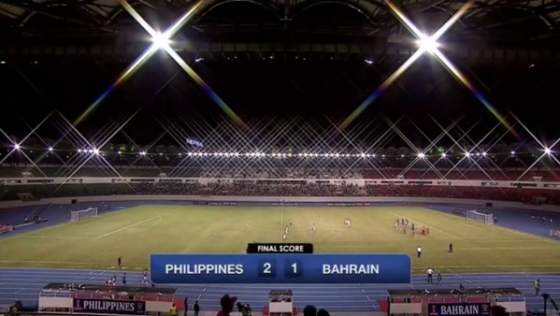 Philippine Azkals beat Bahrain 2-1 in World Cup and Asian qualifier (Full video replay and highlights) - Balita Boss! The Philippine Azkals beat the Baharain to open its 2018 FIFA World Cup and the 2019 AFC Asian Cup qualifiers campaign on Thursday night, June 11 at the Philippine Sports Stadium in Bocaue, Bulacan with the final score of 2-1. Misagh Bahadoran and Javier Patino scored one goal each in the second half to defeat the 106th-ranked Bahrain. The Philippines currently ranked 127th in FIFA ranking. Bahadoran, who came in the 23rd minute for the injured Stephan Schrock, scored the first goal in the 51st minute coming from a nice cross from Phil Younghusband. Javier Patino followed scored the second goal at the 59th minute for a commanding 2-nil advantage. Bahrain Abdulwahab Al Malood nailed an important away goal in injury time for the final result. It was the first win of the Azkals against Bahrain after earlier settling for a scoreless draw in 2012 and a 2-1 loss just last March. This is also the second time the Philippines has won since joining World Cup qualifying matches, with the first being the Philippines' 4-0 win over Sri Lanka on July 3, 2011. The Philippine Azkals will next face the 165th ranked Yemen in its next Group H match on June 16 in Doha, Qatar.